If you’ve been reading for a while, you may have seen some pieces here and there from Golden Tote, or as part of my Budget recaps. It’s been awhile, but I figured I’d treat myself to a tote this month for my birthday. I started following Golden Tote over a year ago and bought my first tote last February. It was love at first checkout. Their house brand, Puella, is made in California and very much has that California-cool-vibe. Their pieces are also sold at Anthropologie, dresses going for about $70-80 and tops for $50-60. When you buy a tote from Golden Tote though, you get to pick two pieces that they’ve curated for that month’s collection, and then 4-5 more are added to your tote by their “stylists” for $149. There’s also a smaller tote for $49 that lets you choose one item and they pick one or two other things for you. The small tote has a much smaller selection of items, however. You then fill out a quick survey/style profile and can add comments about things you do or don’t like. Here’s the thing though: Golden Tote isn’t really customized. Not like Stitch Fix anyways. They basically have a pool of “surprise” items each month that they go and buy from smaller designers, then when your order is fulfilled, you are getting something from that pool. This used to work well for me, as I tend to gravitate towards boho and flowy pieces that they used to almost exclusively stock. Now? Well, it seems like Golden Tote and I may have parted ways in the style department. Besides the unique way of shopping, Golden Tote also has a Facebook group that they encourage tote purchasers to join. You can then buy, sell, or trade items in the group with others, at your own risk, of course. This has proven valuable to me to get pieces a la carte since I haven’t bought totes for a while and only want a single piece. The other bonus? Tons of women who have a shopping/fashion obsession. We’ve had two meet-ups in my area and there are even off topic groups to participate in too. Now that I’ve prepped you with some details about how it all works, onto the Golden Tote review! Renee C Drawstring Drop Waist Dress in Fuchsia (Value $45) – Let’s be real, this dress looks like a hot pink potato sack on me. I clearly have always had “no drop waisted tops or dresses” in my profile, and yet I still got one. I can’t imagine ever wearing this. Puella Pocket Short Sleeve Swing Dress in Black, $78 – This is comfortable and I love the pockets, but the cut has way too much extra material for a size small and really isn’t working for me. Grifflin Paris Yoke Top in Blue (value $35) – This is just so not my style at all. I call this the “Pilgrim” top. It’s too tight on my bust to button up any more than this and it’s terribly unflattering in my midsection. Skies are Blue Embroidered Crochet Top with Tassels in Navy (value $40) – I loved this out of the box and love it on too. It’s just a touch tight in the bust, but it’s not terrible, and this is probably the only thing out of the entire tote that I’m sad about sending back. 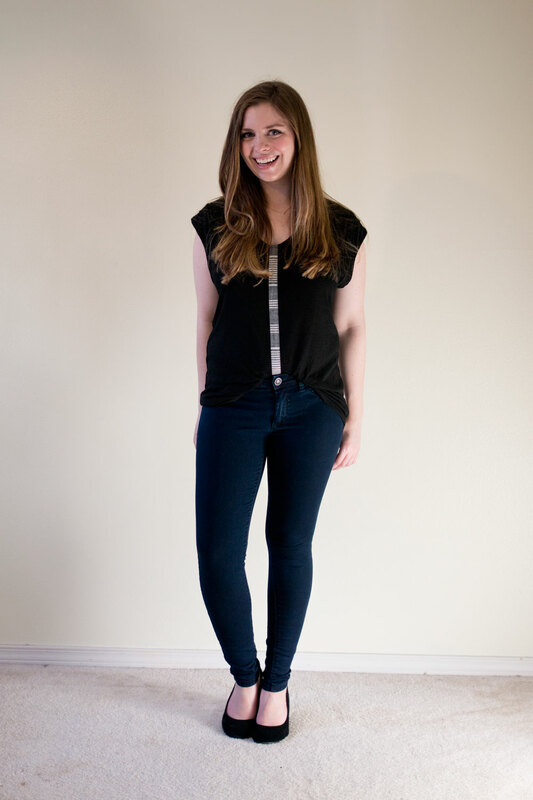 Le Sample Cap Sleeve Top in Black (value $30) – This is cute, but it’s also not quite a short sleeve, so it has that awkward gaping thing going on from the side in the armpit area. I just don’t bother with tops like this anymore because that means they always require a sweater or jacket over them. 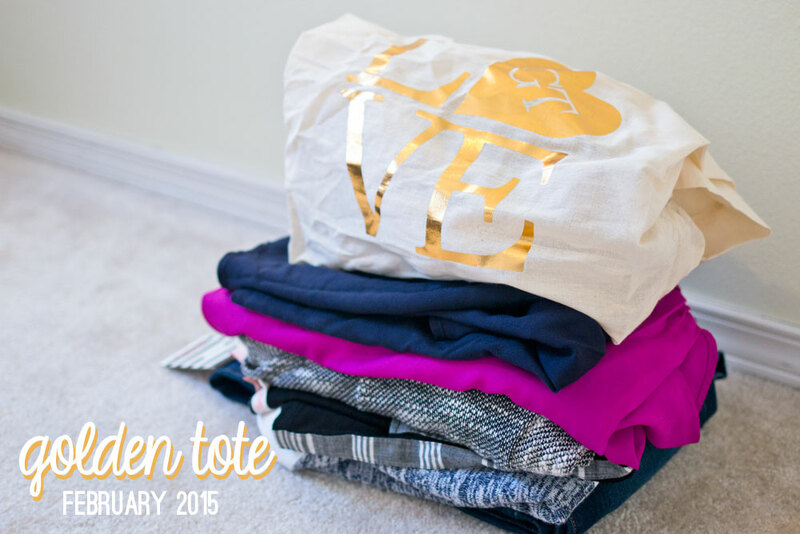 Have you ever purchased from Golden Tote? What do you think about the items that were picked for me? Awww what a bummer! I hate to say it, but I have to agree with you on the stuff they sent you this time around. They just weren’t flattering at all. The only one that I really like on you was the Skies are Blue top…but like you said, not worth the $149. I love the concept, I just hate that you have to keep the entire thing! Yeah, I think that’s the biggest risk with Golden Tote. Hopefully that changes in the future! oh man, I do love that blue tunic + the wide leg jeans — it’s really too bad it’s all or nothing. that seems like a lot of pressure for something that’s not completely personalized? I actually really like the fuchsia dress. Not too potato sacky- or maybe I like my clothes to fit like a sack. LOL. Bummer to see that most of them didn’t work out, and you have to keep it too… The price range is pretty reasonable IF they were to work out though. Haha, honestly I think it looks better from this angle. I took a shot straight on but my face looked weird so I spared you all. ;) Agreed, I think the price range is great, but in this case, I’m better off just returning it all. Ooh I;m not sure I’ve heard of Golden Tote. I mean I’ve heard of their competitor before, but I’m liking the sounds of some of their pieces being sold at Anthro (and you getting it for a fraction). One of my fav stores, ever. Too bad the things didn’t work out for you this month in the subscription. Defintely, that’s one of the most appealing things about it, honestly! And agreed. Oh well! Wow, I love that navy top too! It’s really too bad that everything else was such a bust. I think this would work a lot better if they tried to style the clothes specifically for you. On a separate note, I need some new clothes and I think we have a similar style. Where do you shop for somewhat office appropriate bohemian-inspired clothing? I often use Modcloth, but kind of feel like branching out. Agreed! Rumor has it they’re going to be “fixing” their style profiles to be more custom in the coming months but we shall see. ShopRuche.com is a good one – they actually stock similar/the same pieces as Golden Tote. Lots of embroidery and florals and the like. Lulu*s sometimes has good stuff, I’ve been known to still shop at Forever21. I also find some good pieces in Nordstrom’s junior’s section. Some other online boutiques to try that seem to make their way around the blogosphere – PinkBlush, White Plum, Mint Julep. Some of the stuff is really, really not my taste (think preppy and neon), but with some digging I’ve found some good stuff. that first dress… it’s cute but way too big and yeah, a little potato sack like. and i love dresses like that! lol. Haha! You definitely have the body for those types of dresses – I feel like it just makes me look shorter and frumpy! Thanks Sarah! It definitely is risky. The trading group has saved me from getting stuck with a few bummer pieces, but previously I usually only felt like I had to trade 1-2 pieces. This month was definitely pretty lame in retrospect! Definitely! The owners of Golden Tote are the designers behind Puella, which they sell to Anthro. As for the other brands, I’m not sure that they’re all quite Anthro quality, I would say maybe more akin to Urban Outfitters price range. Agreed, it is a bummer. I also love that color, but the style is just not flattering at all. Oh well, win some lose some! I have to say that the first dress at least photographs well, but I can see how it would be shapeless in person. Somehow I get Golden Tote emails (maybe I read about it one time? I ended up googling it after they showed up in my inbox). I didn’t realize it was an all or nothing deal–I thought you absolutely had to keep all of it. Do you have to pay a styling fee? If not, and I’d purchased it for my birthday, I would just keeping getting it until I got a bag that I wanted to keep because it does seem like an excellent value, if you like all of it! I love the wedges you put with those outfits! Nope, no styling fee! You pay upfront for the entire tote, so in this case it was $149 + $7.95 shipping. When I pay my own return shipping, they’ll credit me back the tote cost and the original shipping fee. So I’m out about $12 to ship it back with delivery confirmation. The only issue is their lead time with shipments and returns. They’re very small, so this shipment took about a week to go out, and their processing on returns I’ve heard can take as long as 2-3 weeks. Items also have a tendency to sell out quickly on “tote day”. Some are restocked throughout the month, some are small runs that they only have limited amount of stock from. Hope that helps! It definitely does look like a maternity dress. If it was on a pregnant lady, I’d probably think it was cute… Definitely a bummer, but oh well! I wonder how well that works for them with the all or nothing but not personalized routine goes. That would make my decisions so hard because $149 is a lot of money for a lot of items you may not like over 1-2. Yeah, definitely. Generally I really, really like my chosen items which have the “higher” value, so I’ve just sold or traded the other pieces (usually 1-2) in the trading group and keep the rest. This was just an unfortunate tote all around! I have tried Golden Tote on my own as well. The pieces were so terrible that I didn’t even blog about it. I had such high hopes for them, too!! I really liked the last top on you though!! Maybe you can buy the top you want in the FB group? I think I will try to do that. Definitely not a good tote, sorry you had that experience too! As I was scrolling down I thought the navy top was cute and the best one too. Good taste:-). I haven’t heard a ton on Golden Tote so thanks for the Insiders perspective! Ha, that’s funny – great minds think alike! ;) Of course, hope it was helpful in case you were ever contemplating trying their service! You can totally rock the hippie look, Jenn! Reminds me of That 70s Show! Aww its a bummer that they were all disappointing and that its all or nothing. Meh. I loved the hipster jeans and top though! I’ve never heard of Golden Tote. I’ll have to keep an eye out for them. That pink dress is adorable.